Breakfast Plus is Grace Community Services‘ outreach to the homeless and hungry. 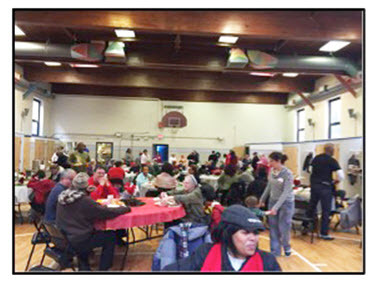 The program provides between 50 and 100 hungry people with a hearty breakfast every Saturday and Sunday from 7am to 9:15am at 39 Erie Street in downtown Jersey City. Volunteers are needed for the 3rd, 4th and the occasional fifth weekend of the month to come and help cook and serve. Or maybe you would be willing to prepare and drop off sides including potatoes, sausage, corn bread, pancakes, hash, mac and cheese, (really anything covered in cheese)? The program also needs non-perishable items like boxes of potatoes au-gratin, corned beef hash, dish towels, cooking spray and contractor trash bags. If you have a vehicle and don’t work full-time, how about joining the roster of people who could pick up the BJs donation or make a shopping trip to a local store. Food insecurity is the state of being without reliable access to a sufficient quantity of affordable, nutritious food and it is at an all-time high in New Jersey. Data from the 2009-2011 US Census shows that 12.3%, the equivalent of 391,986 households in New Jersey, were food insecure at some point during that period, a record high for the fifth consecutive year. Further, city-data.com reports that in 2009 the poverty rate in Jersey City was at 21.1%, nearly double the rate of poverty in New Jersey as a whole. One out of five people in Jersey City currently face or are threatened by food insecurity. The breakfast program helps people like me– people who don’t have enough, people who are on welfare, people who are homeless, people who can’t make ends meet. It supplements what we have and what we can do. There are many people who don’t have enough food to eat, and this program helps us– helps our community. Email breakfastplus@gmail.com if you are interested in contributing.